I am a Solider under Command – I Am Not Ashamed Of The Gospel Of Christ! As the soldiers that crucified my Christ I too am a solider under command. My Christ, Lord, Captain of the Hosts spoke and said to me, if you love me do my commandments. His first commandment to me is to love the Lord my God with all my heart, soul, strength and mind and so I do this for He and He alone is my life, truth and my way. He came to give me liberty from all my fleshly lusts and to make me into a new creation which he has done in me being obedient to his word and walking in his commandments. As a soldier under his command he has given unto me and all others who follow diligently after him and seek, thirst and hunger for righteous a ministry of reconciliation for that is the sole mission of his soldiers, to reconcile all those upon this earth through Christ my Lord to the Father and the Kingdom of God. He sent another when He left this earth to teach, guide and comfort, his Holy Spirit. This was such a precious gift to his children and bride for his spirit dwelling within me takes what is of his and reveals it to me. My Lord commands get up and go and speak these words to this lost soul and so I do and then stand back and watch the King of Glory come in and illuminate the Truth to this lost souls heart. To love my enemies and so I do in his love for natural man is incapable of doing this. If my enemies seek food or drink or clothing I freely give it to them without malice or contempt but in his love that he has filled my heart, soul and mind with so that my cup runneth over. He commands me to tear down the strongholds that satan has built in the lands where he has placed me to walk upon. He has given me his weapons which are not carnal ones but are spiritual living breathing words – his words. At the speaking of these words as the Captain of the Hosts and King of Glory, He comes down with his mighty army of angelic hosts and destroys all the strongholds that stood in the way of his work being completed where my foot meets to ground of this world. You see my brothers and sisters we are all soldiers under his command. As he is mighty in battle so are we for we are hidden in him and seated in heavenly places with him. He has not given us a spirit of timidity but one of power, his power, the Holy Ghost for His Kingship has absolute authority in the entire universe. He has given us his love and filled our cups so that they runneth over for the lost, sick, broken and bound upon this earth. His prefect love drives out all fear and his word in us as we eat it daily it gives us a sound mind for it is his mind that as new creations in him that we now have. He commands me to teach his lambs and so I do. He commands me to feed his sheep and so I speak the words in the Holy Ghost so that life, love, hope, purpose, joy and much more are instilled in all his sheep. He commands me to cry out from the walls his warnings to his people whether they listen or not, for in not doing so their blood would be on my hands. He commands to simply believe the words my God, His Father has spoken and so I do. He commands to lay hands on the sick in him and see them recover. He commands me to cast out the evil spirits in his precious name so that these bound broken souls are set free. He commands me to raise the dead both living ones and those who have breathed their last. He commands me to remain in him and I will l remain in you and be with you till the end of the ages. He commands me to look to the invisible and not the visible for there is nothing too difficult for him to do for what is impossible in man is possible for God Almighty. He commands me to put my light upon a hill for all men to see so that these ones who the Father is drawing unto him have a place and person to come to and hear his living truth. 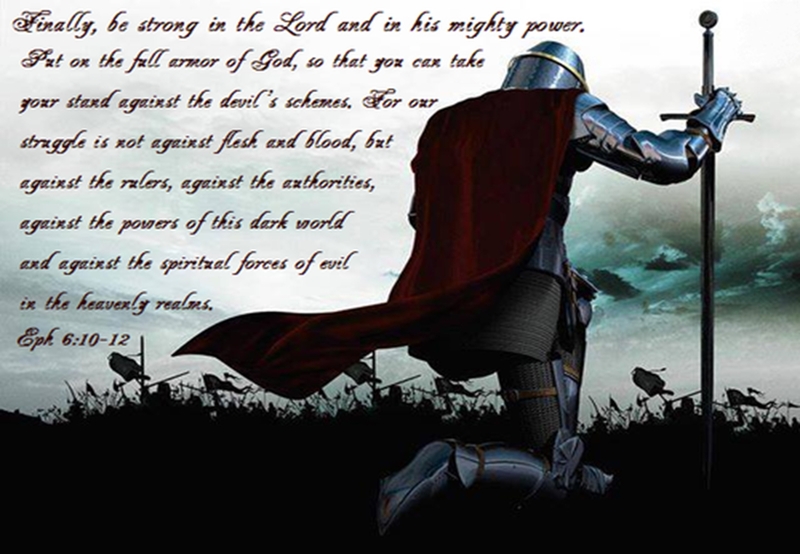 He commands me to put on all his amour, the helmet of salvation, breastplate of righteousness, belt of truth and upon my feet the gospel of peace, Taking up the shield of faith and his mighty sword – his word so in all things I will be able to stand against the wiles of the devil. So you see my brothers and sisters, I am a solider under command but I do all these things and more not because I am compelled to do as the roman soldiers did on the day they crucified the Lord, but I do these things in love for he took such a wretched vessel such as me and made it whole through the shedding of his blood upon that cross at Calvary. But the story did not end there for he rose again three days later and is now seated at the right hand of his father and in his resurrected power I too am seated with him in the heavenly places as are you. Therefore endure the hardness of this world as a good soldier of Jesus Christ, for no man that warreth in the spirit entangles himself with the affairs of this life. For in doing his commandments you will please him who hath chosen you to be a soldier. This life is but for a mere moment in time and is nothing compared to the glory that awaits you in the Kingdom of God that is yet to come. Be of good cheer our Lord would say for I have overcome this world. To the general assembly and church of the firstborn, which are written in heaven, and to God the Judge of all, and to the spirits of just men made perfect these words have been written for your encouragement.